Our recent history has proven that the politicians of both political parties have done exactly that – they are spending away the resources of the American People. Our national debt is now in excess of 17 Trillion dollars, the President has submitted a budget that increases governmental spending across the board except for national defense, and Congress has repeatedly passed legislation extending the debt limits of the United States. In return, the American People are required to shoulder the burdens of these actions under threat of confiscation of assets and incarceration. Is this really the United States that the Founders had in mind? Our Founders had the concept of a limited government accountable to the People of the country. As the Declaration of Independence states, “all men are created equal, that they are endowed by their Creator with certain unalienable Rights, that among these are Life, Liberty and the pursuit of Happiness.” Interference from, servitude to, or dependence upon a government was not part of that concept. Indeed, the Constitution of the United States clearly state what limits were placed upon the Federal Government, and what Rights of the People were not up for debate or alteration without the consent of the People. And yet, here we are, 225 years after the ratification of the Constitution, we are watching this country of ours being decimated by politicians for no other reason than naked political power and megalomania. 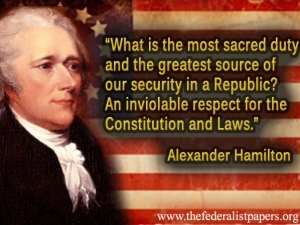 The Founders understood that our Constitution was in danger of such actions by unscrupulous people. Indeed, we find ourselves under a government similar to one that our Founders sought to liberate us from, and to prevent from being inflicted upon the People of the United States. While we do not have a monarchy to contend with, we have something much worse – an Executive Branch that has multiple branches of bureaucracy, a Legislative Branch that refuses to be responsible to the People, and a Judicial Branch that looks to other countries for legal precedents rather than view the history and laws of this country. Almost all of these Branches are headed by people, both elected and appointed, who are driven by personal agendas, political philosophy, and egos beyond compare. This is a many-headed Hydra that is overwhelming for the People to comprehend much less deal with. Government via the politicians and the bureaucrats depend upon the size and mind-numbing complexity of government to achieve it’s goals, which are self-preservation and expansion. Just in the past 15 years, we have witnessed the beginnings of a government takeover of healthcare, the establishment of several new government departments (the TSA and DHS among them), the Patriot Act (where rights are suspended if a terrorist activity is suspected), expansion without accountability of government subsidies, and bailouts, grants, & investments (mostly bad) of industries. And this list is barely scratching the surface. Additionally, I read the other day that there are over 172,000 Federal regulations, and the number is climbing every day. It was speculated in this article that it would be possible for you, an ordinary citizen, could be violating a half-dozen of these regulations and never even know it! This is the government We The People have, not the one that We The People were to have. “James Madison wrote that “a people who mean to be their own governors must be armed with the power that knowledge gives”. We The People must be educated of our Constitution, our Bill of Rights, and the limits of Government. This will be the only way We The People can effect change within our Country. This entry was posted in Political and tagged Bill of rights, constitution, Declaration of Independence. Bookmark the permalink. great post sir. It is too bad more people do not realize this.